I do not like to plant my vegetables in straight lines. I know that this particular quirk is a result of watching my grandfather set up his surveying equipment just to make sure that his vegetables lines were perfectly parallel and perpendicular to his fence lines. He was obsessed with straight lines and was the only man that I’ve ever known that can tell if you picked the wrong sized screw out of the cabinet from ten feet away. I abhor straight lines in the garden. And although I always measure twice before I cut or sink a screw into a board, I always place it just a touch off the mark and it makes me smile. My Pirate frowns and I can also feel my grandfather flipping in his grave with disapproval. I plant my vegetable garden intensively so that the plants grow to cover the soil so that I don’t have to weed or rototill the pathways. “It’s a sustainable method,” I explain to other gardeners. And I grow my radishes in curves or whatever shape I feel like. It just so happens that a senior co-organizer at the Hazel Dell School and Community Garden is a staunch believer in straight lines and would make my grandfather proud. At a meeting early this year, she told me how it was going to be, in no uncertain terms. Straight lines, Little Missy…or else! Afterwards, feeling a bit bruised; I took Barnaby to the dog park in the pouring rain right before dusk. As I entered, I saw a stranger, a red bearded man with a hat and I nodded a quick hello before I started to take off in the opposite direction only to be greeted by his black Great Dane, Ezri. “Oh, you’re Ezri’s Dad, aren’t you?” I asked, remembering a brief introduction from his lovely wife. “Why, yes I am.” He said with a Southern drawl. Barnaby danced around Ezri, raising his massive white paws up in an invitation to play, which Ezri accepted. The two Danes raced ahead of us, as rain poured off of our hats and we introduced ourselves. The conversation quickly turned to science fiction followed by food. The dogs roared in through the open gate of the empty small dog park and took several giddy victory laps inside while Ben and I laughed and cheered them on. The heaviness in my heart evaporated as I watched Ezri and Barnaby cement their friendship. And I felt like I had stumbled upon a kindred spirit. We all meet up regularly for the dogs to play, they’re best friends after all, and we discuss important topics like real barbecue and deviled egg recipes. Ben approaches cooking like a mad chemist. When he doesn’t have the right kitchen equipment like a sous-vide machine, he simply builds his own version out of spare parts. 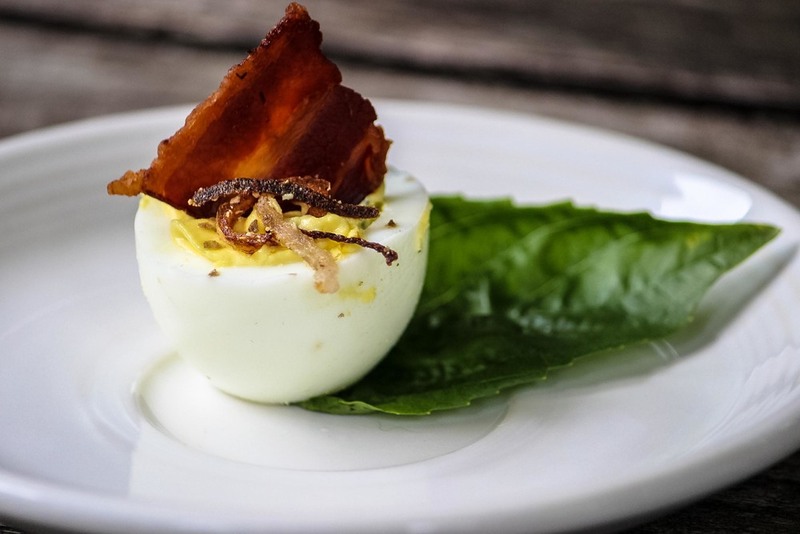 Recently, we collaborated on a new deviled egg recipe for him to unveil at a dinner party. And they were a hit! Ben, the Mad Chemist, steams his eggs for ten minutes for the perfect hardboiled egg. You can even use fresh eggs and have the shells slip right off when you peel them. Just tap each end of the egg on the counter then roll it under your hand and watch the shell come off. It’s a genius trick. Cut the bacon into fourths and cook them over medium low heat until crisp. Cook a few extra pieces, just in case someone you love ‘samples’ a few pieces like My Pirate did. Slice up the shallot into thin slices and mix with several pinches of rice flour and cornstarch. Remove the bacon from the pan, turn the heat up to medium high, and add a spoonful of duck fat to the pan. Fry the shallots in the oil until they are brown and crispy. Then scoop them out and drain on a paper towel. Peel your hard boiled eggs, cut them in half horizontally, and put the egg yolks into a bowl. In the bowl of a small food processor add the mayonnaise, Dijon mustard, white wine vinegar, basil leaves, red cayenne powder and salt. Pulse. Then add the egg yolks and pulse until the mixture is smooth. Taste and adjust the seasoning. Place the egg white cups on a platter and cut a tiny sliver off the bottom of the egg whites to make them stand up straight. Pipe the egg mixture into the egg white cups. Garnish them with the bacon squares and the fried shallots. Serve.